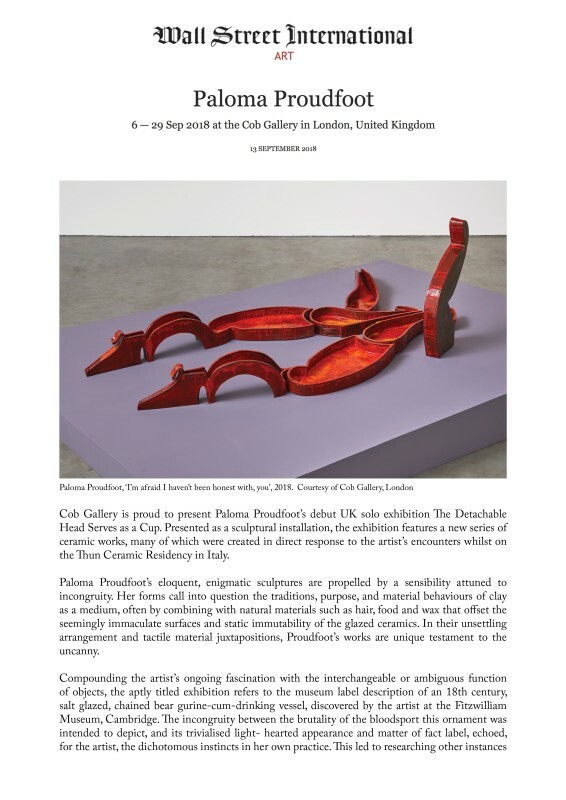 Cob Gallery is proud to present Paloma Proudfoot’s debut UK solo exhibition The Detachable Head Serves as a Cup. Presented as a sculptural installation, the exhibition features a new series of ceramic works, many of which were created in direct response to the artist’s encounters whilst on the Thun Ceramic Residency in Italy. Paloma Proudfoot’s eloquent, enigmatic sculptures are propelled by a sensibility attuned to incongruity. Her forms call into question the traditions, purpose, and material behaviours of clay as a medium, often by combining with natural materials such as hair, food and wax that offset the seemingly immaculate surfaces and static immutability of the glazed ceramics. In their unsettling arrangement and tactile material juxtapositions, Proudfoot’s works are unique testament to the uncanny.